Last week we posted about Milen Rangelov’s (gat3way) new RTL-SDR driver which has exposed filter and gain settings for the R820T/2 chip. This should let you tweak for optimal reception much better. Previously the driver was only available for Linux, however, now over on SourceForge user randaller has ported this driver to Windows. To use the driver in SDR# simply unzip all the files into the SDR# folder, then while using the dongle in SDR# open the librtlsdr_wincontrol.exe file to open the control interface. The interface also has the ability to directly write values to a register, which together with the newly released register datasheet, can be useful for experimenting with the R820T2 chip. Unpack all files to SDRSharp folder, start SDR# playback, then run controller exe file. Do not forget to allow software to use UDP/32323 port in your firewall. You may use this rtlsdr.dll with osmocom or other software, of course. It is fully compatible to original one. All values should be decimal. You may use this feature to develop own gui controller with beauty knobs. 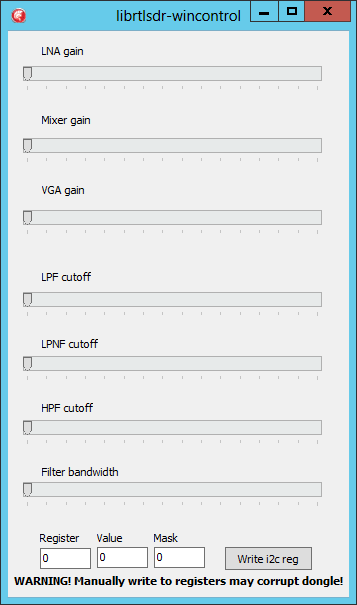 These filtering options should be added to hdsdr, sdr#, and the rest of the sdr apps so as to maximise performance of the beloved rtl, that is, if they’re not already. I can’t see a sdr app dev not wanting to use these functions but then again I’m not a dev but I do stare at code often enough. Shame they’re not in the signal path in direct sampling mode. With this driver I have significant frequency shift on L-Band. Signals are shifted +2 MHz approx (1547 MHz instead of 1545 MHz). And even 1000 ppm correction in SDR# is not enough to fix the issue. This driver working on my old R820T chip. But modrtl SDR driver is good because this driver can below down after 24 MHz .